Today, beads long buried are born to treasure. One hundred sixty-five artists and crafters joined the challenge to finally use those beads we keep tucked away. You see, beaders are a bit like dragons…we like to hoard treasure. But Lori over at Pretty Things knows that the only thing better than hoarding your favorite beads is sharing them! 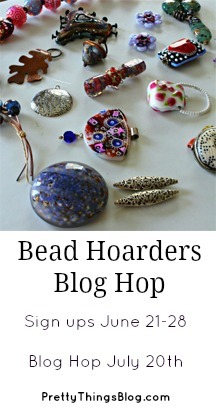 So, welcome to Lori Anderson’s Bead Hoarders Blog Hop. My Serengeti Necklace started with a few beads purchased several years ago at The Bead Museum in Glendale, Arizona. I’ve played with various designs for them but nothing really clicked until I was given a bag of tree bark. Finally, this elephant has a home! Want to see more treasure? You’re sure to see some beautiful creations by the following artists! Oh I love what you did with that elephant. Beautiful! Thanks Molly! I miss the museum–all the different exhibits and history. I had to go in for a closer look at the bark! That is such an interesting idea, and they look completely natural and at home together. Well done! Thanks!! The bark actually has little white spots so I used a bit of blue food coloring to adjust the tone. Yes, sharing is fun, Robyn! I have loved elephants since I was a child, so I just adore your tribal inspired necklace. Besides getting to drool over new designs, I love these hops as a great way to find blogs that are new to me… adding you my Bloglovin! The bark is so creative and perfect for your elephant! One of dreams is to go to the Serengeti and ride an elephant. I even wrote a blog post about it awhile back. I LOVE elephants so this piece really speaks to me. I hope your dream comes true. I love elephants too and collect them in many ways. I’d like to read your post! Love how the piece of tree bark brought the design together! Very organic and pretty! Thank you…and thanks for coming by! 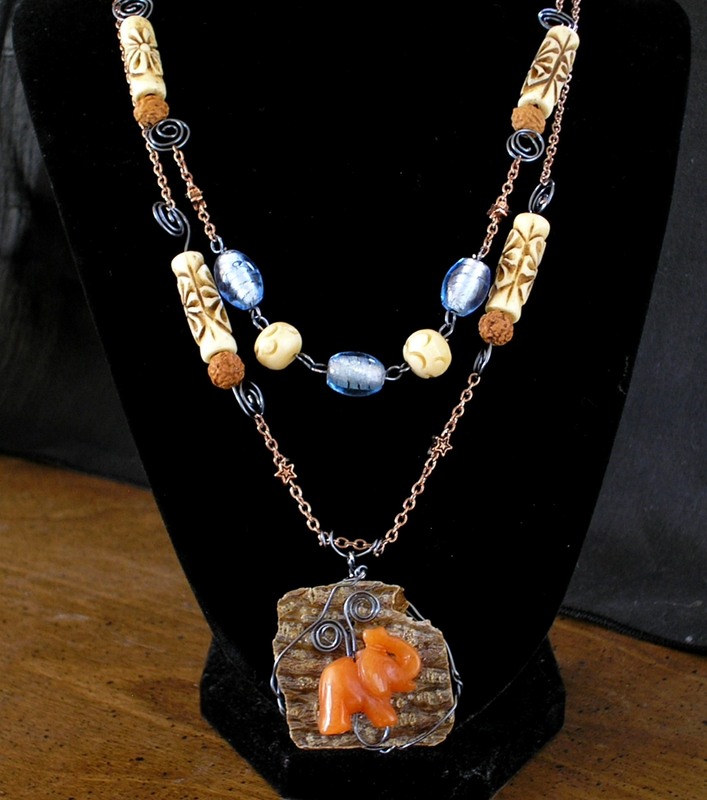 Great necklace, and what a sweet new home for your elephant! I’m always amazed at how the most random things will sometimes bring a design together – who would have thought tree bark?! But it works – what a great necklace! So pretty and so clever!!! Hope you get to ride that elephant! A beautiful piece.Good color choices. Hi Pam, Becky, and Adlinah– So glad you came by! Thank you. I am so glad you found a home for your elephant.. I think every elephant should have a home. 😉 Beautiful necklace. Elephants are amazing…we could learn a lot from them. I love how your necklace turned out. I want to go to the bead museum! It was so much fun… the exhibits have moved to the Mingei International Museum in San Diego. I’m not sure how much of the collection remains but you should definitely check it out. I am in love with your necklace ,my style. Oh my gosh! Bark! That’s awesome! Totally completely unexpected but absolutely perfect. That is such a lovely piece ! Just beautiful! I love how you created your elephant focal, so very creative and it looks amazing. Lovely design. The elephant focal is wonderful. You make me want to go to back to the Serengeti 🙂 You made a beautiful necklace! Thank you to everyone for taking the time to hop over and for your wonderful comments. There were so many blogs and so many beautiful pieces–I’m honored you took the time to visit me. I would have never guessed that you used tree bark-a lovely necklace! I love the way you wire wrapped the elephant to the focal. Beautiful necklace. Thank you! The tree bark came to me in a bag–it had peeled off of someone’s tree so they brought it to me (knowing I collect all kinds of strange stuff for crafting). This particular bark is smooth on the underside and the bark is fairly pliable until sealed…easy to work with. Very unique and interesting necklace, love the bark, perfect with your elephant! The elephant pendant is so beautiful. I like how you made this necklace. Dragon or not, your necklace is very tribal and that pendant is wonderful. Love your absolutely fabulous necklace! Hi Janine, Thank you! I remember you have those wonderful, chunky bracelets:) I love the one with the bluebird. What a cute elephant! Love it. Nice to meet you Shalini, I like the way you set up your store. A splendid home for the elephant – very ingenious too! I love the colour palette of the necklace – the blue beads just bring so much life into this piece. Lovely design! Oooh, your use of the tree bark is absolutely inspired! What a great use of it. Wonderful job. Fantastic necklace! I love what you did with the elephant and tree bark! Thank you! BTW, I love your Etsy shop. Such a pretty background for the beautiful elephant! I love the entire piece! Thanks for coming by♥ I adore all those leaf earrings you made for the hop. Absolutely gorgeous, I love your necklace! beautiful necklace. I love the colors you chose. I like how you pieced everything together, very nice. Wow, just, wow. I love love love everything about the necklace you created and the elephant is just wonderful. Amazing job!